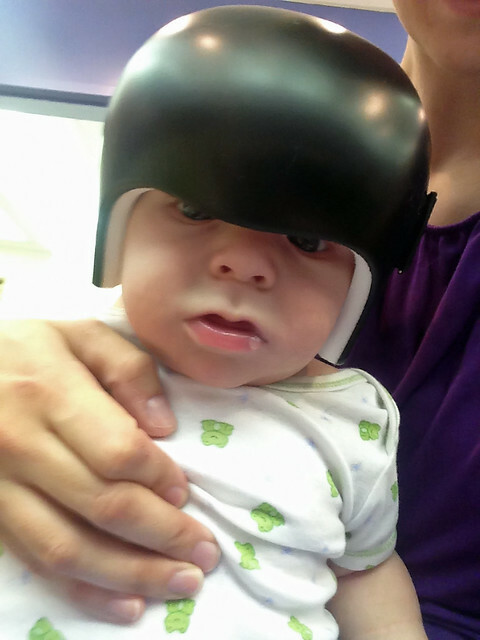 When I learned of our baby’s craniosynostosis diagnosis, and that I wanted to push and fight for him to have the less invasive surgery, I also knew that baby helmet therapy was part of that package deal. The surgery fixed about 20% of his sagittal head shape, but the four months of helmet therapy was going to fix the other 80%. I went through so many emotions about the helmet: is it the right decision? How will he adjust to it? How will I adjust to it? Will it cause us lots of problems? We are nearing the end of our helmet journey and I hope it will be beneficial to share tips and advice on what to expect, how to cope, and even what I (and others) would have done differently. I’ve called on other helmet baby moms to compile this advice here for you; it’s going to be okay! I, as I imagine many moms in my shoes, internalized Jonathan’s helmet experience. I imagined what it would feel like to sleep with a hockey helmet on and to wear something on my head for 23 hours a day. 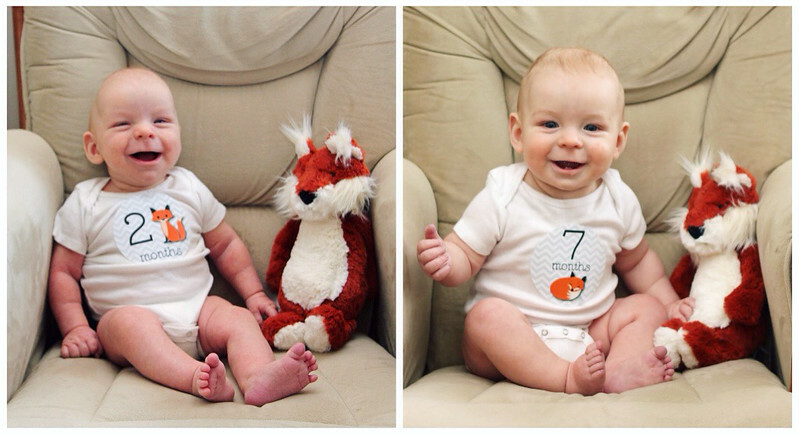 I say this as a mom and as a former pediatric nurse – babies are SO resilient! Far more than you and I as adults. 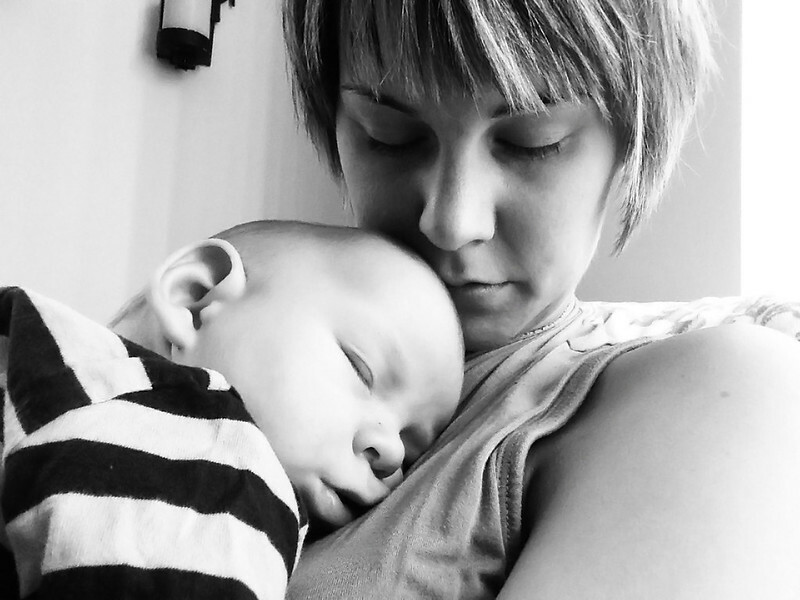 Trust in your baby – they’ll surprise you at how awesome they’ll do! You can still snuggle and bond and rock your baby with their helmet on and wear them and love them just like before. It seems so selfish, but it’s oh so true and almost every helmet parent will say the same thing. From the moment Jonathan’s helmet went onto his little head for the first time (pictured below, before adjustments) he didn’t care one iota. He didn’t fuss, wonder, worry – nothing. Me, however, I cried the first two nights of him wearing it full time. During his hourly helmet break I just felt so sorry for myself that I wouldn’t be able to snuggle his head and that this whole journey just wasn’t fair…but it will be okay. It. Will. Be. Okay! Your baby will make you stronger. 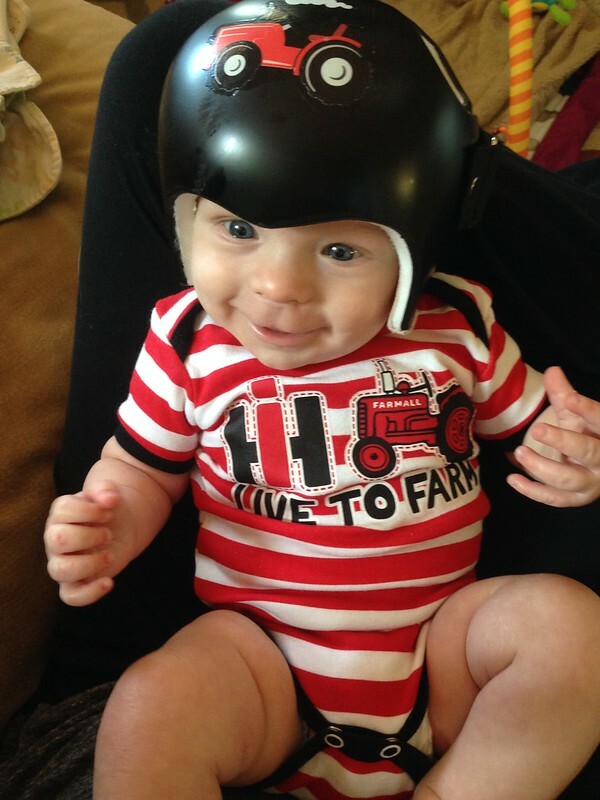 I would say in my experience in the helmet community, the majority of babies adjust really really well to their helmets, but most still do have an adjustment period. Some, however, do not do well in the beginning and are unhappy – but they will adjust. The more they wear it, the more they will get used to it and don’t be afraid to go in for extra support and adjustments as needed. 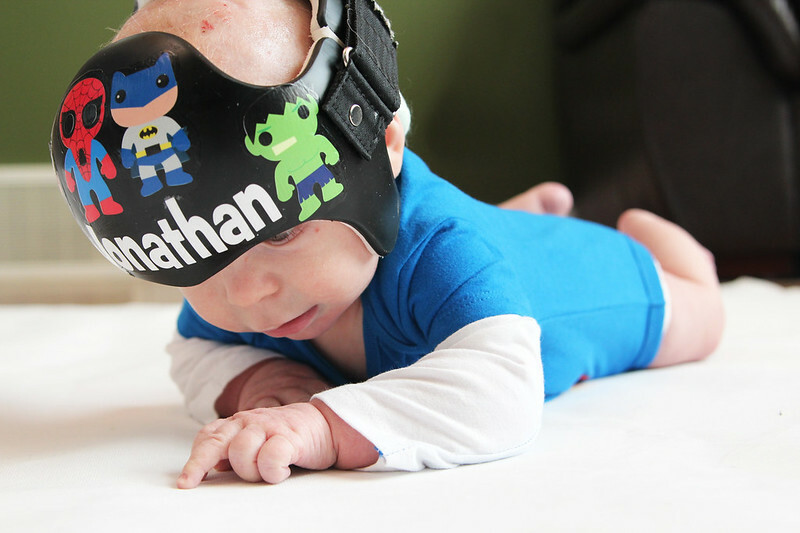 After one of Jonathan’s first naps in his helmet – he did so well! Snuggle right into that helmet and give it kisses as you would your baby’s head. I never thought it would happen, but there have been many days where I almost forget to have his helmet break because it just naturally became a part of him so fast! If your baby is younger and is breastfeeding and/or bottle feeding, I found The Nursie pillow a lifesaver! Jonathan was still sleeping on me after his feedings for awhile after he got his helmet and this saved my arm and helped to keep us both comfortable. Even before Jonathan had his surgery, I knew that I wanted to be prepared for his helmet. I wanted to make it fun for us and cute and decorate it. I ordered a few sets of decals from Bling Your Band and they have been so easy to apply and to change, and they are amazing conversation starters! We got compliments on his cute helmet all the time! Many places that wrap cars will also wrap the helmets for free, you can add bows to your little girl’s helmet, and you can even paint the helmets as long as it’s okay with your orthotist. Be sure to check out how to paint a helmet if that interests you, hire a local artist, or ask the amazing Paula Lazardo to do it for you! This never happened to us, but I know it can and has to other helmet families. My advice to anyone worried about looks and comments is to be confident, give that person a big smile and let the world (and them) know that you don’t care. You love your baby for who they are and that helmet is a sign of how strong they are and all that they’ve overcome and will overcome. Your baby doesn’t know ANY different and they are not embarrassed or worried about people’s looks or comments, so I urge you to do the same. It’s mostly kids that would come up to us and ask us why he’s wearing the helmet and you can’t fault the curiosity and innocence of a child. Take this as an opportunity to teach about why your baby is in a helmet! 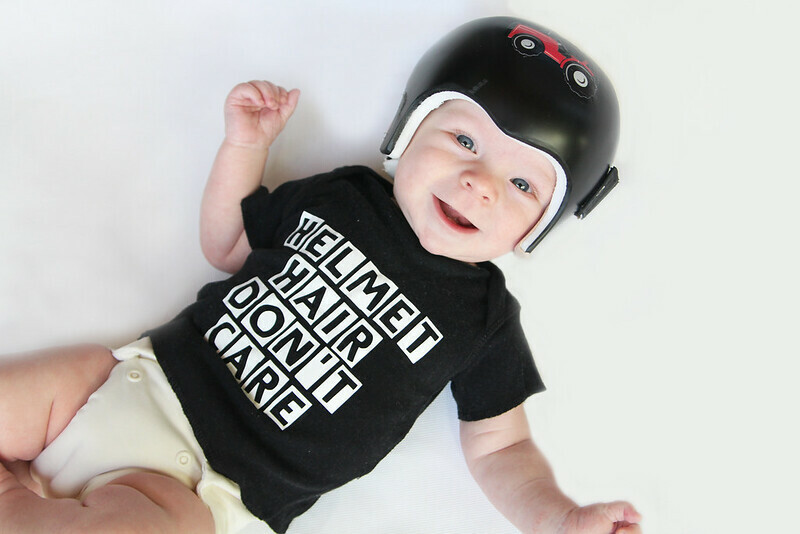 Cute shirts for your baby can also help let the world know how much you love your helmet baby and that it’s all okay! If your baby ever gets a fever or a pressure spot that won’t fade after an hour (per our guidelines), you have to take their helmet off. Jonathan had his first fever and ear infection during his helmet therapy and I was so worried about taking his helmet off. I didn’t want him to regress or us miss a growth spurt, but you have to take their helmet off and they will be okay! There’s even been times where he’s so fussy or unsettled and I feel like I’ve tried everything, so I take his helmet off in the middle of the night to see if that helps. Often it didn’t, so I’d put it back on in the morning and he did great either way. In our journey I’ve come across babies that have to have 2-3 weeks off of helmets because they’ve outgrown a helmet and are waiting for the new one – it will be okay! 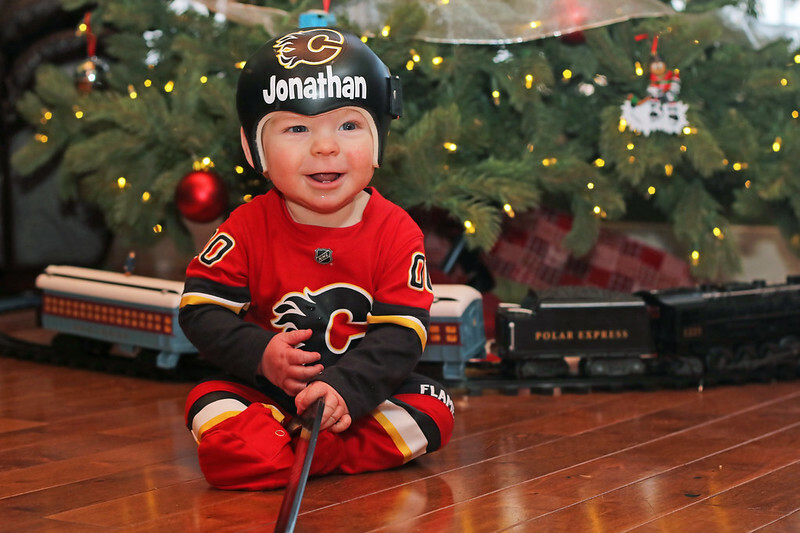 Jonathan isn’t a tummy-sleeper, but if your baby is – it is okay, and they will be okay to sleep on their tummies with a helmet. If anything, the helmet provides an extra barrier and lifts their head/face up off the mattress even more. They really don’t know any different and will be wearing their helmet 23 hours a day, so make sure they get their tummy time and sitting time in to help with their development. While we’re on this topic – don’t compare your baby to other babies. I’ve seen babies with and without helmets crawling and pulling up at 7 months old, while my baby still has a hard time sitting up on his own at 7 months and is nowhere near crawling. This is one of the best hacks that I came across! Our OT told us we are only allowed to clean his foam helmet with 70% alcohol, as the 90% alcohol can break down the foam and/or cause irritation to the scalp. I couldn’t find a bottle of 70%, but I got a box of alcohol wipes and they’re so easy to use to clean the foam. You can also dilute 90% alcohol with water and put it in a spray bottle to clean the helmet that way. Be sure to check with your OT products/methods that are approved to clean your helmet. I know lots of helmet parents in warm climates take the helmet off and wipe it down if baby is getting too hot, don’t be afraid to do this! It’s unreal how small a tiny baby head and helmet can build up stink! It seems the more snug the helmet, the stinkier they get too! A lot of moms recommend Mustela shampoo or Head & Shoulders shampoo for baby’s hair to combat the smell. Jonathan has really sensitive skin and scalp, so I don’t always use soap, or even shampoo to clean but he does get a bath every single night. 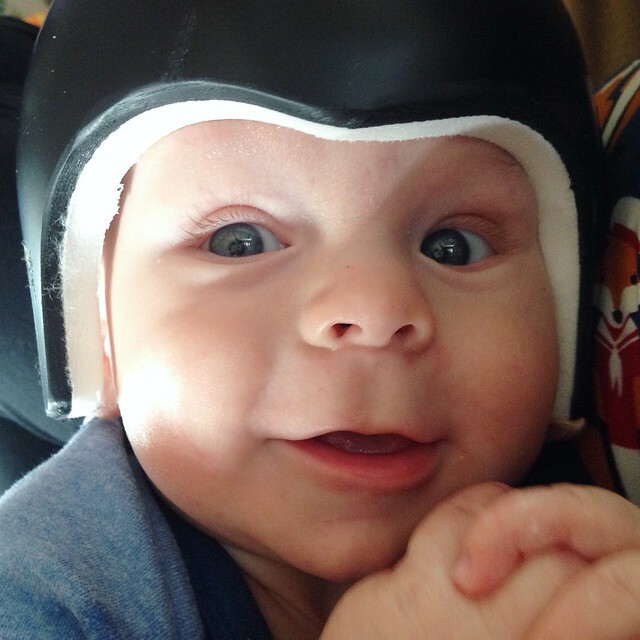 This fits more into the plagiocephaly/brachycephaly family – but there may be more than one option for your helmet, so be sure to check them all out. For our cranio helmet, we only had one option for the type of helmet, but got to choose the colour/pattern of the helmet. 14) Be consistent and motivated by the end results & don’t compare heads! There have been many times on this journey where I ask myself “why”? Does he really need to wear it 23 hours a day? Can’t he have extra breaks? Does it all matter? YES. Yes it does. Be consistent with wearing, care, cleaning, appointments – all of it. It is so worth the end results! Your baby’s head may only be able to be corrected and “fixed” a to a certain degree or measurement because of your own genetics and theirs. 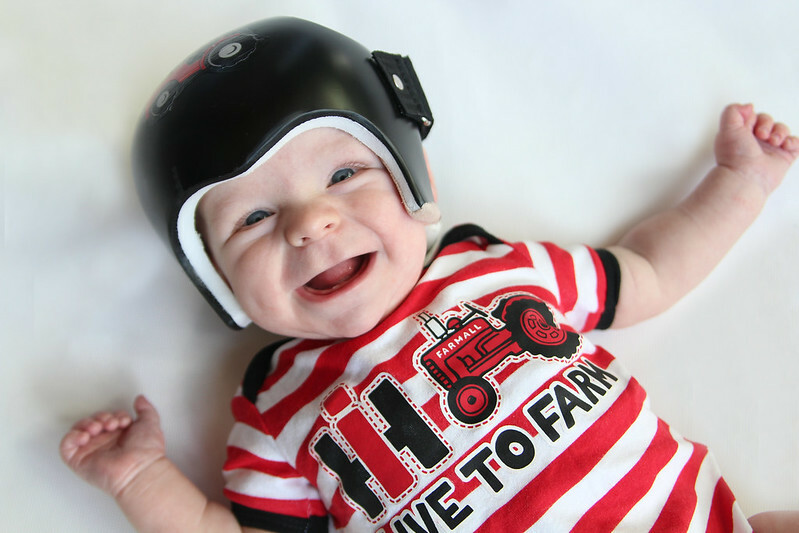 Don’t compare your baby’s head shape to others – they are perfect the way that they are and the helmet has helped them so much! Jonathan’s forehead may always be slightly bossed and his temples may always looked a bit pinched, but my oldest son’s temples were pinched as a baby too, looking back at his photos! He has come so far and we’re so happy with the results! Cranio for us wasn’t a sentence, it was a fresh start. A renewed faith, heart of thanksgiving, appreciation of blessings and one step closer to a healthy baby boy. Be it cranio or plagio/brachy – choose the joy in this situation and try not to be resentful or bitter about the situation. Of course we’ll all have our moments, I certainly did, but embrace the helmet and your baby. 16) Join support groups, use them, & ask for and accept help! I couldn’t have walked this journey without support from my husband and our families. My mother-in-law and sister-in-law have helped watch our other children when I was away with Jonathan at his biweekly helmet adjustment appointments, and my mom and sister-in-law have both had us stay at their homes and fed us when we’re gone. A big thank you to all the moms who shared their experiences with me and contributed ideas and advice into this blog post. If you’re about to be a helmet parent, please feel free to join the support groups or to comment or send me an email for anything you need – I’d love to be there for you in this journey. This post does contain some Amazon affiliate links if you should so decide to purchase some of these recommended products. Our 9-month-old son Hayden just got his helmet 6 days ago. We’re up to 23 hours/day of wear time. He literally never cries but that has changed with the helmet. It seems like when he starts to get tired, he gets extremely fussy. This never happened before he started wearing the helmet. Sometimes he’ll roll over onto his tummy while he’s sleeping and not be able to get back onto his back because of the helmet and just cry and cry. I know that there’s an adjustment period for him wearing the helmet but it’s so hard to hear him cry and know that we have to keep the helmet on. Thanks for your post about helmet wearing. My sweet 7 month old is soon to be fitted for a helmet. He had pt for torticollis and has a flat spot that just won’t go away. It hurts me because I had so hoped it wouldn’t be necessary. Thank you for this. I needed to hear from someone who’s been there. Thank you for submitting this article. I just left a message stating that we are going to go for the helmet to help our little ones plagiocephaly. I’m selfishly sad about not being able to kiss her beautiful head every two seconds and wondered how it would be snuggling her in my arms. You're very welcome! Best of luck and you just have to get all those snuggles and kisses in the helmet break. It is a hard adjustment but it goes by fast, especially for plagio—I promise! This is a great article! I found it about 4 months after my son started his helmet therapy but I’ve already sent it to 2 moms who will be beginning their helmet journey! One thing to add, we use Johnson’s & Johnson’s baby shampoo on our son’s head and helmet daily and it really gets rid of the smell. Thanks for passing this along! I always caution to ask your OT/orthotist about what products are okay. We were told nothing but 70% alcohol as anything else might break down the foam in his helmet.